Voice Mobile brings one more exciting feature phone for all its valued buyers of the World. Voice has launched new mobile phone of V Series V490 with amazing features. This is very light and stylish feature phone of Voice Company along with latest features. It is providing Dual SIM option in this cellular phone for using two SIMS connections in same period. Voice V490 gives highly digital rear camera option with LED Flash lights and users can capture multiple photos by using this hand-set. Voice Mobile is also very excellent manufacture department for launching feature phones and in this present scenario it is introducing many exceptional features phones for its customers with affordable rates. Voice v490 Mobile is also an excellent hand-set for all those cellular operators who are searching feature phone in reasonable price because they can easily get all latest feature phone incentives by buying this mobile phone. This hand-set is providing feature of external micro-SD storage up to 32GB and users can download multiple files and contacts by using it with correctly. It is good looking hand-set with slim body structure and users can easily bring this mobile phone in pocket and go everywhere without any problem. It is also providing long lasting battery option in this cellular of 1800 mAh non-removable option. The best part for buying of this product is it is giving one year warranty facility of this mobile phone by United Mobile. 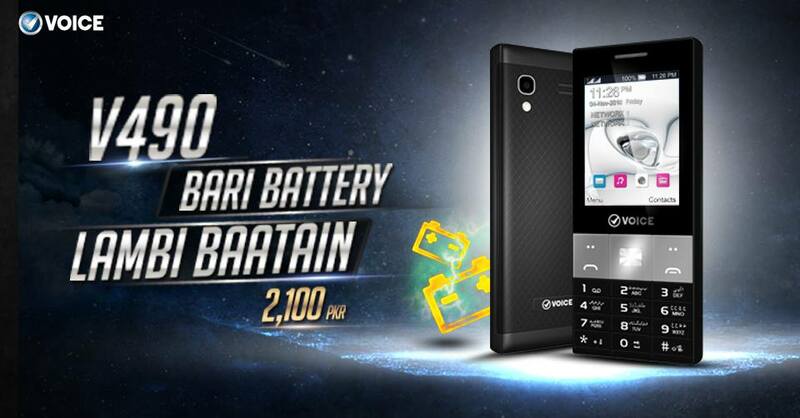 Customers can use this cellular phone till one year with warranty facility. It is giving crystal display screen facility with excellent signal quality and users can avail all telecommunication facilities through this product without facing signal issue. This is an exceptional feature phone for all the feature phone buyers and they can do multiple tasks after buying this product. Get the details of complete specification of this Voice hand-set from the below. Rear Camera: Digital Camera with LED Flash. Display Screen Size: 2.4 inches. Audio: 3.5mm audio jack, MP3 and Other multi-media players. Ringtones: Polyphonic ringtones, Downloadable and MP3. Latest Features: External micro-SD storage up to 32GB, Auto-call recording feature, Speaker phone, Video player and One year warranty of United Mobile.